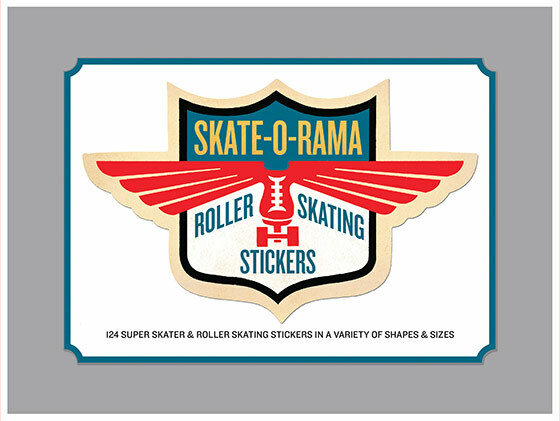 124 Stickers (3 each of 7 Sticker Sheets + 1 Jumbo die cut vintage labels in a box - celebrating the golden age of roller skates, roller skating, roller derbys and all manner of wheeled shoe fun. 124 Stickers (3 each of 7 Sticker Sheets + 1 Jumbo die cut vintage labels in a box - celebrating the golden age of roller skates, roller skating, roller derbys and all manner of wheeled shoe fun. Proudly made in Seattle, with high-quality paper, and packaged in a deluxe keepsake box.